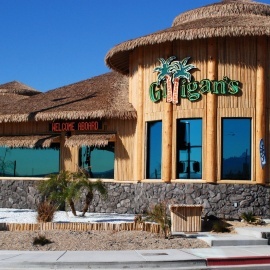 To enjoy your time while visiting Gilligan's, you can enjoy a cocktail while viewing the famous Colorado River through large aqua-tinted windows at your table, watch your favorite sport on one of three 50″ plasma televisions, or you can indulge yourself with a little gaming on one of our 15, state of the art Video Poker machines. If poker is not your bag, the machines also have Blackjack, Reel Slots, Keno and numerous other games that will surely please both the casual and serious player. AND ALWAYS FREE DRINKS FOR PLAYERS.